Think it's too late to book a summer holiday by the sea? 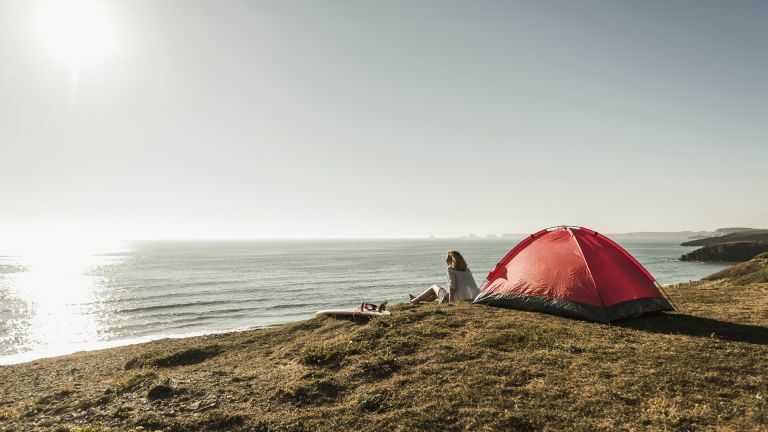 Think again, as there are a wealth of beautiful coastal campsites for you to explore... And some of them still have pitches left to accommodate your last-minute summer staycation. Britain is home to a bevy of beautiful coastal campsites, from surf-friendly sites in Cornwall to family fun holiday parks in North Yorkshire. Each offer stunning sea views for a fraction of the price, plus facilities and activities (either on-site or nearby) to suit a range of outdoor interests. Coastal camping can have positive effects on your general wellbeing, too—all that fresh air, sweeping scenery and beach-side fun can be a powerful mood booster. If you enjoy camping and you love the idea of waking up to the sound of the ocean, there's no better way to kick back and enjoy the slow life for a while. Each of the sites featured in this list combine breathtaking views with plenty to do, from scenic walks to rock climbing. After something more exhilarating? Many coastal campsites offer access to beaches where water sports like surfing and jet ski touring are popular. Which campsite by the beach is best for you depends on what you’re looking for, but before you do anything you should check what months the site is open. Some sites close down in autumn/winter, while more sheltered campsites open year-round. If you're planning on camping with family or several friends, check if your preferred site is kid-friendly or open to large groups of people. Also explore the on site facilities (showers, toilets and cooking areas) and whether advance booking is needed for specifics such as an electric hook up. Nearby pubs and restaurants are another tick in the box for the best coastal campsites, as you can pop over for a lunch or evening meal, which saves you from having to cook each day of your trip. With panoramic views of the south coast of the Gower Peninsula, Three Cliffs Bay will take your breath away. The Bay takes its name from the three limestone cliffs that jut out into it, which you can overlook from the Three Cliffs Bay Holiday Park. The five-star family-run site welcomes campers with tents, caravans and motor homes. There's free Wi-Fi, disabled facilities, baby change facilities, and a shop selling cakes and pasties. This Welsh coastal campsite is pet-friendly, as is the beach. The path down to the beech is steep so you'll need decent walking shoes, but there is a longer, less steep path if you'd prefer. Looking to venture beyond the beach? Go rambling along the 35-mile Gower Way, which forms part of the Wales Coast Path. Or perhaps try pony trekking or visit some of the nearby historical sites including Weobley Castle. To maintain its tranquillity, the Three Cliffs Bay Holiday Park is exclusively for families and couples. There’s a 10pm quiet rule, making this the perfect place to relax after an adventure-packed day. Ocean Pitch is the ultimate coastal campsite for adrenaline junkies. Nestled just 50 yards from the beach of Croyde Bay, you can’t get much closer to sand than this. Surfboards, bodyboards, paddle boards and wet suits are available to hire, and you can book a surfing lesson with affiliated surf school Surfing Croyde Bay. There are on site toilets and showers, as well as a Snack Shack serving hot drinks, breakfasts and lunches. There are also several electrical hook ups, plus free Wi-Fi. If you’re looking for an action-packed adventure by the sea, we recommend pitching up at Ocean View in the spring or late summer when the beach is less crowded and the surf is picking up. If you’re not much of a planner, Treen Farm, situated three miles from Lands End and sitting above Porthcurno Bay, is a great coastal campsite for you as no advance bookings are taken; just turn up and pay for a pitch on the spot. There's a touch of nostalgia about this laidback campsite by the beach, with its oldschool coin/token operated showers. There's a shop on site, and the nearby Logan Rock Inn serves hot food daily. What Treen Farm has in abundance is ocean panoramas: the campsite offers enviable views from Lizard Peninsula to the Isles of Scilly. Fishing trips run from Penzance, and nearby Porthgwarra – where Poldark's filmed – is home to climbing spots such as Gwennap Head. The historic Minack theatre is a 15-minute walk away. Located a short drive away from Robin Hood’s Bay, the cliff-top Whitby Holiday Park overlooks the National Trust-owned Saltwick Bay and offers views of the North Yorkshire coastline. At low tide the bay is perfect for rock pooling and fossil hunting, and the Cleveland Way Coastal Path is accessible directly from the park. Whether you choose to venture further afield – the North Yorkshire Moors are a short drive away – or spend your time swimming in Saltwick Bay, the campsite is equipped with a shop, cafe and bar to ensure you're well looked after. Large groups are welcome, and a playground and family club ensures there's plenty for the little ones. There’s free Wi-Fi, and laundry facilities too. Limited electrical hook ups are available so advance booking is recommended for those with camper vans. With 800 pitches across 300+ acres, Shell Island has a real community feel, which is enhanced by an on site restaurant and tavern. This campsite by the beach is open to campers with tents but doesn't allow caravans. Shell Island is nestled in unspoilt countryside and has three bathing beaches. The main beach runs for six miles down to Barmouth and the two smaller beaches are available when the tide is out. If fishing is more your thing, grab your tackle box and hire a boat to take you out to St Patrick’s Causeway, a 14-mile reef brimming with marine life. The views are spectacular, and on a good day you can see from nearby Snowdonia all the way to Cardigan Bay. Online booking isn’t required for this coastal campsite, but it is recommended for weekends and holidays when the site gets busier. A small campsite with 42 pitches, Camusdarach sits between Arisaig and Mallaig in one of the most scenic parts of the Scottish Highlands. The site is open to tents and caravans, and there are laundry, disabled and baby changing facilities. There’s also free Wi-Fi and the option to drop off your devices for charging if you’re not using one of the electric hook ups. The on site shop/takeaway sells tea, coffee and croissants, plus pizza in the summer months. If you’re a keen photographer, we can’t recommend Camusdarach enough because of the wealth of wildlife that surrounds it year-round. This coastal campsite is walking distance from three sandy beaches, from where you can swim and fish. It’s also possible to launch sea kayaks and small boats. Half or full day canoe and kayak hire is available if you don’t own a kayak. Rainy days are accounted for, too: why not take in the views from Fort William to Mallaig, including the famous Glenfinnan viaduct, on board the Harry Potter train?